Voted 'Best Towing' by The Monett Times' 2014 Best of the Best Contest! 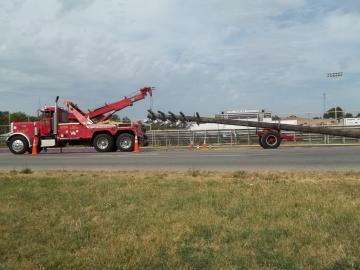 Thomas Towing & Recovery does light, medium and heavy duty towing both locally and long distance. Jerry, along with Jeremy Weston, Manager, work 24/7 to make sure that customers' needs are met. Thomas Towing & Recovery handles a variety of needs: towing, accidents, police calls, lockouts, jump starts, tire changes, fuel delivery are to just name a few. But they also have done jobs out of the normal range some of which have included: moving large equipment, taking down silos, decking trucks, distressed large animal recovery, moving small buildings, etc. Our long standing customers know that they can call and we will give them the fair service that they have always received in the past. We would like the opportunity to count you as one of them. We do our best to take care of our equipment, and believe that those who do will be more likely to take good care of yours. Sissy, Jerry's constant companion will be happy to great you at our shop's door with a wagging tail. Sissy has logged thousands of miles with Jerry over the years. Visit us and like us on Facebook and read her article where she was featured in the national magazine, Tow Times, as the March 2012 Tow Dog of the month. Jerry Thomas has over 40 years of experience and has a long family history in the towing industry. 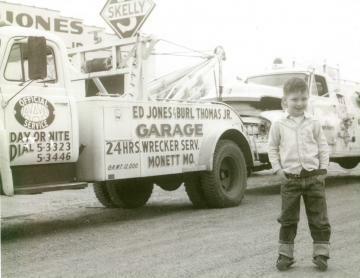 His grandfather, Ed Jones, began the family tradition in 1932 when he established Ed Jones Wrecker Service. After his sudden death in 1965, his son-in-law and daughter, Burl & JoAnn Thomas continued the business until their retirement. 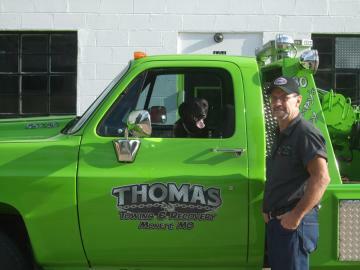 In May 2012, Jerry opened Thomas Towing & Recovery LLC. Jerry's mother, JoAnn, continues to work in the office along with his wife, Rebecca. We serve motorists in surrounding areas including Aurora, MO, Mount Vernon, MO, Cassville, MO, Wheaton, MO and beyond.